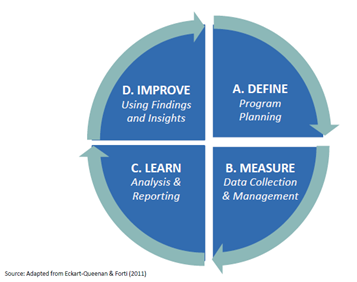 Monitoring and evaluation – M&E, or MEL as it has come to be known, the ‘L’ standing for learning – has a bad reputation. It’s difficult. It’s boring. Pulling all the information together takes f-o-r-e-v-e-r. Plus, we only do it because there’s a board meeting coming up or because a donor asks for it. MEL needs a rebrand. By design, public policy research is aimed at change. It is basically unfinished unless key findings are packaged and disseminated so that they have a chance to feed into the policy debate. To influence some sort of positive change. With this in mind, tracking the impact of research, or at the very least understanding who is accessing it and how, should be a regular part of what thinktankers do. Lauren Gelfand, Director of Policy Engagement and Communications at the African Population and Health Research Center, puts it another way. We [think tanks] don’t necessarily spend nearly enough time or resources tracking where our work has landed. That does us a disservice as it prevents us from truly understanding our impact and where there are opportunities to broaden that impact or demonstrate the value of our thinking and analysis. Of course, just doing a lot of monitoring, and only using this data to satisfy donor requirements or for annual reports, is a real missed opportunity. The main benefit of MEL is the learning part. It is about using what you gather to tweak your dissemination approaches, to prioritise your output types and to troubleshoot when things go a bit wrong. Research uptake, what is it and can it be measured? A lot has been written about the range of tools available to track communication outputs. This piece pulls some of them together nicely, and explains how they might be integrated into an M&E dashboard. Other articles have been written to help communication staff understand the range of new metrics that have emerged in light of the growing use of Twitter, Facebook and other social media platforms. What is the difference between ‘reach’ and ‘impressions’, for example? A wealth of information also exists to help think tanks structure their M&E, including Louise Ball’s blog on the broad questions you should be asking when trying to frame and measure research communication impact. But what should you do if you’re a small think tank without much capacity? What if you don’t have a full-time communication person, let alone a communication team, like the bigger think tanks do? What if your director isn’t that interested in monitoring, evaluation or learning? To help answer this, it is important to start seeing MEL as integral to every part of your research and communication, not just something that gets tacked on at the end. The first step is to be clear about what you want to measure. The easiest way to do this is to look back at your organisation’s strategic aims or policy influence objectives. You’ll also have to take note of what your donors want, of course, but try to integrate what you need to gather for them into your overall tracking to be as efficient as possible. This is important, not just because it is good to have a clear goal, but because different think tanks try to influence policy in different ways. Some focus on big campaigns that aim to affect a specific policy change (the advocator). Others are more interested in ensuring that certain side-lined voices are included in policy discussions (the convenor). What you decide to measure will depend a lot on what kind of influence your organisation is trying to have and how they are seeking to have it. If your organisation is more of a convenor, then spending loads of times trying to find your organisation’s name in press cuttings might not be a good use of time. Journalists don’t usually mention the organisation that created the ‘space’ for discussion and debate. They quote the person who gave them the juicy soundbite. A focus on media monitoring might give the impression that your organisation isn’t having any impact at all. It would be much more useful, both in terms of monitoring and learning, to focus on who came to your event (numbers, types of organisations, gender breakdown, etc.) and how many people accessed the meeting output (podcast, meeting report, etc.). This sort of tracking allows you determine whether the right people are at your table, who you might want to bring into the fold and how you might do that. Provides an instant snapshot of your current audience (who you’re reaching with your outputs). Points to particular audiences you might need to grow or reengage (if they have become inactive). Allows you to have a conversation about segmenting your users and tailoring content. Provides information on popularity of different themes and different types of products (reports vs. policy briefs vs. videos). Helps make decisions about which outputs to prioritise. Tells you which events are popular and starts a conversation about why (was it the theme, location, timing, profile of speakers?). Gives a great indication of how much notice to give before an event, where to publicise and your event dropout rate. Provides an instant snapshot of a very important audience. In addition to what I’ve listed in the table above, a lot of which can be gathered automatically using analytics and database software, I usually suggest one more thing: an outcomes log, or what some prefer to call an impact log. This is a place to put the formal and informal feedback that doesn’t really have a place. It can be done using a simple Excel sheet. The great benefits of an impact log and what it looks like in practice are outlined well in this SlideShare. Why did policy brief X do so much better in terms of downloads than policy brief Y? Why did so many journalists attend our event on South Sudan in December? Why aren’t there many NGOs on our mailing list? They are a key audience for project Z, so we need to increase our numbers. Should we test two different versions of our newsletter to see which gets the most click throughs? Should we invest in getting some media training since our engagement with journalists is quite poor? These meetings should happen once a quarter, with important decisions captured quickly in a short note. Report progress against key action points at the next meeting, if not before. This gets people really invested in the process, especially if tangible differences can be shown, which they inevitably can. Carolina Kern: Strategic communications consultant currently based in Nairobi.